NOTE: A number of subscribers reported that they did not receive this week's edition of the Weekly Briefing. It is being re-sent as a courtesy to ensure all subscribers receive the latest news and events from Town Hall. To report a problem with your e-mail subscription, please call (856) 488-7878. Cherry Hill residents will see no increase in their municipal taxes for a second year in a row, under the budget introduced to Township Council on Aug. 19. The proposed $64,703,621 plan is approximately $542,000 less than the budget adopted for the previous fiscal year. This budget is the result of efficient and effective management and smart fiscal policies, and my goal moving forward is to continue to keep taxes stable, make smart investments in our future, and provide Cherry Hill residents with the best possible programs and services. A public hearing and final adoption will be held Sept. 26. To read more about this year's budget, click here. On Monday night, Cherry Hill honored one of its most beloved educators and school administrators, Dr. John O'Breza, who retired this summer after 45 years with the Cherry Hill School District. Dr. O'Breza began his tenure in the Cherry Hill School District in 1968, when he began teaching English at Cherry Hill West. He spent the last 11 years as the Principal at Cherry Hill East. Throughout the years, Dr. O'Breza has been second to none, and provided countless young men and women of our community with a quality education - and, ultimately, helped them grow into productive, educated and well-rounded citizens. Few have left a more lasting impact on our community, and on behalf of the entire Township of Cherry Hill, I was honored to present Dr. O'Breza with a special proclamation to honor his legacy as an educator. While his presence will be missed, Council and I wish Dr. O'Breza health and happiness as he begins this new phase in life. Council and I also honored 59 young athletes and almost a dozen coaches and organizers who represented Cherry Hill at the 2013 JCC Maccabi games, held Aug. 4-9 in Orange County, California. These remarkable young men and women were among more than 2,000 teens who took part in the week of events, and truly made our community proud. This annual event helps foster in our youth a sense of mutual respect and good sportsmanship, while allowing the teens to have fun and build friendships. The games will be held in Cherry Hill in 2014. Township Council and I were proud to present the group with a proclamation and certificates at the start of Monday's Council meeting. The Camden County Mosquito Commission will spray between 8 p.m. and midnight tonight in: Barclay Farm and Barclay Farm South, Kingston, Locustwood, Haddontowne and Forest Park. The spray is not harmful to humans and pets, but those who are sensitive to irritants or have respiratory concerns should avoid direct contact. The Commission sprays in neighborhoods and open spaces, but will not spray on private property. Residents can curb the growth of mosquito populations by checking their properties for sources of standing water, such as swimming pools, trash can lids and other containers. Click here for more information on the sprayings and mosquito prevention. For further information or to report a problem, contact the Mosquito Commission at (856) 566-2945 or skeeters@camdencounty.com. This summer has seen a perceived increase in the number of skunks and other 'nuisance' wildlife being spotted in Cherry Hill neighborhoods, and even on residents' lawns and in homes. These encounters can often become unpleasant, and I have heard from a number of concerned residents. Independent Animal Control, which provides animal control services to Cherry Hill Township, has put together a sheet of helpful tips to safely, yet effectively help deter skunks and other nuisances from private yards, gardens and lawns - and help all nature's creatures coexist in the community. For more information, click here, or contact the Municipal Clerk's office at (856) 488-7892. From now through Sept. 2, the Cherry Hill Police Department is taking part in a statewide campaign aimed at reducing impaired driving on our roadways. The 'Drive Sober or Get Pulled Over' enforcement initiative began Aug. 16, and is sponsored by the New Jersey Division of of Highway Safety. According to statistics from the state, impaired drivers nationwide kill someone every 30 minutes, or 50 people per day and almost 18,000 people every year. 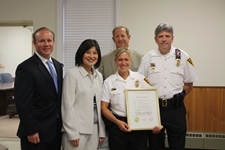 In 2012, impaired driving played a role in 19 percent of all motor vehicle related fatalities on New Jersey's roads - and with the Labor Day holiday approaching, Cherry Hill Police are cracking down on drivers who drink and drive, with the hope of saving lives. Cherry Hill residents will see no increase in their municipal taxes for a second year in a row, under the budget introduced to Township Council on Aug. 19. The proposed $64,703,621 plan is approximately $542,000 less than the budget adopted for the previous fiscal year. This budget is the result of efficient and effective management and smart fiscal policies, and my goal moving forward is to continue to keep taxes stable, make smart investments in our future, and provide Cherry Hill residents with the best possible programs and services. A public hearing and final adoption will be held Sept. 26. 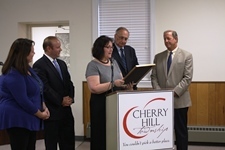 To read more about this year's budget, click here [http://www.cherryhill-nj.com/CivicAlerts.aspx?AID=375] . The Camden County Mosquito Commission will spray between 8 p.m. and midnight tonight in: Barclay Farm and Barclay Farm South, Kingston, Locustwood, Haddontowne and Forest Park. The spray is not harmful to humans and pets, but those who are sensitive to irritants or have respiratory concerns should avoid direct contact. The Commission sprays in neighborhoods and open spaces, but will not spray on private property. Residents can curb the growth of mosquito populations by checking their properties for sources of standing water, such as swimming pools, trash can lids and other containers. Click here [http://www.cherryhill-nj.com/CivicAlerts.aspx?AID=371] for more information on the sprayings and mosquito prevention. For further information or to report a problem, contact the Mosquito Commission at (856) 566-2945 or skeeters@camdencounty.com [mailto:skeeters@camdencounty.com] . 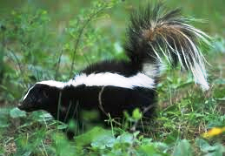 This summer has seen a perceived increase in the number of skunks and other 'nuisance' wildlife being spotted in Cherry Hill neighborhoods, and even on residents' lawns and in homes. These encounters can often become unpleasant, and I have heard from a number of concerned residents. Independent Animal Control, which provides animal control services to Cherry Hill Township, has put together a sheet of helpful tips to safely, yet effectively help deter skunks and other nuisances from private yards, gardens and lawns - and help all nature's creatures coexist in the community. For more information, click here [http://www.cherryhill-nj.com/DocumentCenter/View/1854] , or contact the Municipal Clerk's office at (856) 488-7892.